Whew! It’s been a long journey, hasn’t it? I haven’t done an update about partnering with Habitat Chicago because quite honestly, I’ve been a bit exhausted with the process. It IS an exhausting process if I’m telling the truth, but it’s worth a lot of things. I’ll do my best to share those in this blog post, but forgive me if I start to ramble. This past weekend, several friends, family members and volunteers got together with us for our home dedication, and I thought that I would document it. 500 hours of sweat equity. 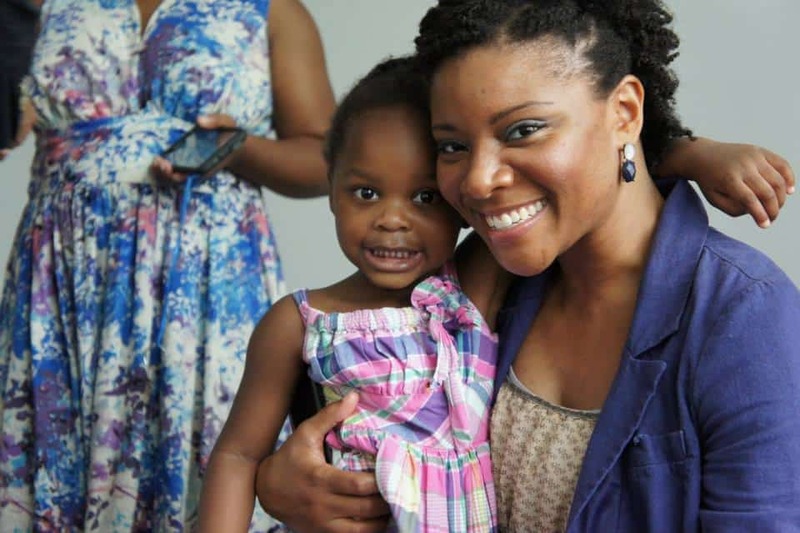 That was a combination of classes, on site work, and general events that were supported by Habitat Chicago. Remember Raise Your Hand Chicagoland? That helped us get a TON of sweat equity, and we learned so much about different affiliates around the Chicagoland area as well. I want that to marinate though. Essentially we worked 12 and a half work weeks getting our sweat equity in to be able to qualify to move in. On top of that, we’ve visited the site for our home to make sure that things are going according to plan. I’ll admit at first, I felt bad about dropping in on the site to see what volunteers and the site supervisors were up to, but realized that in any situation where I would be getting my house built from the ground up, I would be doing the same. Essentially, I was imposing the same restrictions on myself that I hate for Habitat supporters to do. WE are home buyers. WE will be paying a mortgage, and WE have a right to make sure that our home is coming together like we want it to. Thank goodness that we have a supportive construction crew that understands my need to really be involved. Over these last few months, they’ve been tested just as much as we were. We’ve learned how to raise walls for building, lay sub-flooring, tile, lay hardwood flooring, install drywall, sand, cut, saw. Everything under the sun except for plumbing and electricity – although it’s not over yet. This is hard to answer right now. We still have to get ready for closing, and pack up our current home. I’m all kind of mixed up in feelings at the moment. Nate starts high school on Tuesday, and life is just kind of hectic. 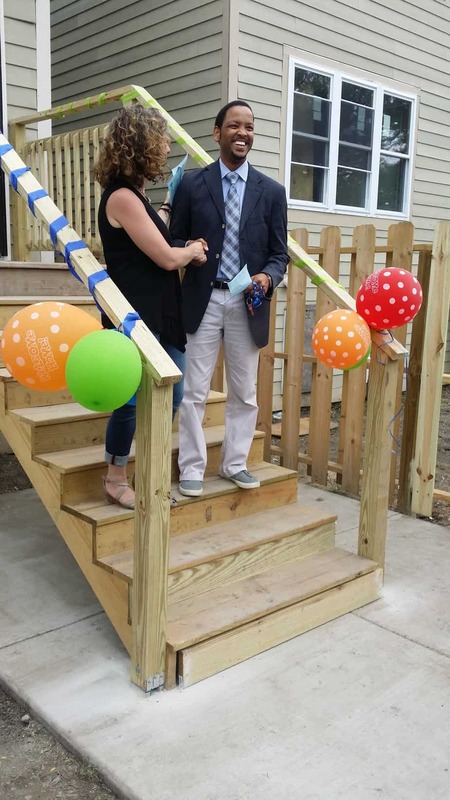 However, being able to go to our dedication last weekend – even though the house is not technically finished, showed me that we’re on the way to the finish line. I would love to get photos of the FINISHED product soon, so be ready for those. Until then, we’re still kind of anxious to get on with the move, and not believing that we have SO. MUCH. STUFF. TO. PACK. Like for real people, we may have to have a yard sale to get rid of a lot of this stuff. The home dedication put the final wheels into motion though, that’s for sure. 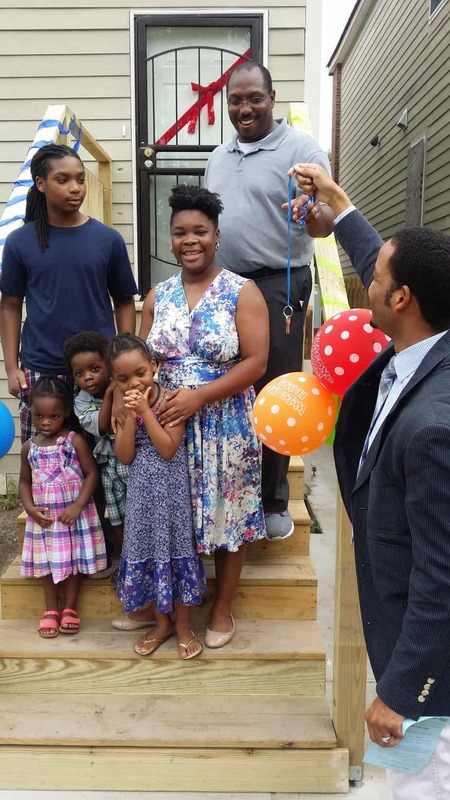 So, a dedication is a fancy way of showing all of the Habitat for Humanity supporters, volunteers, and family members how a finished house looks. For the most part, most volunteers may come out and work on a home maybe twice. Usually, they don’t get to see the finished product. 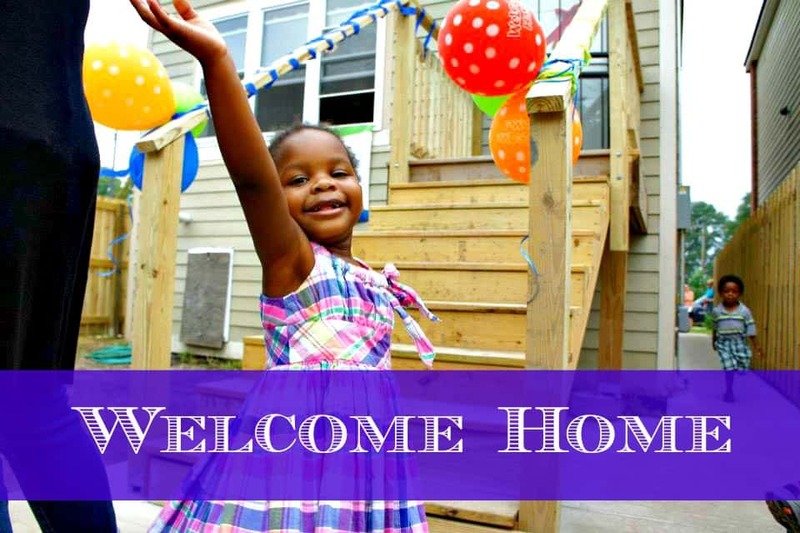 This is an open house of sorts, and a way to collectively bless the house with all of the Habitat affiliate members. We’ll be having a house-warming once we move in properly, but for this – everyone involved is invited to come and see things before we’re moved in. Our parents, and several family members and friends were present at the dedication, and some of them really surprised me by coming out. Even though I invited them, it’s always so wonderful to see people take time out of their day to come and support us. 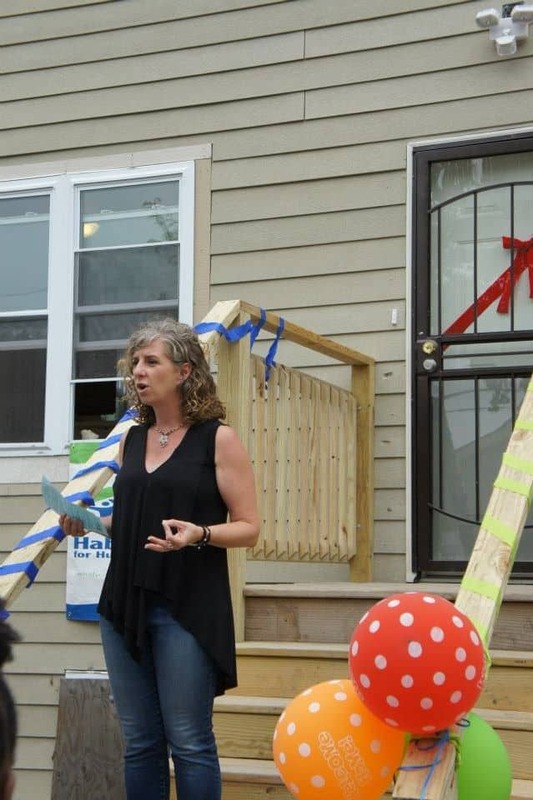 We had an opening statement by Jen Parks, who is the director of Habitat Chicago and she shared words of support for us in our new journey. She’s been a pleasure to work with, and I appreciate her door always being open for me to come in and kind of decompress all the stresses of being a partner family. We were then treated to words about us from a very dear friend of mine. Elder Adrian Patterson. He and I have been friends for almost two decades, and he’s become one of my best friends in general. There are very few gentlemen that I have good friendships with, and he’s a great one. AND – he and his brand spankin new wife, Alicia traveled from out of town to be with us on our special day. She’s such a sweetheart, and she’s been deemed my friend because she’s just that. She also got Lil’ Miss to sit still and take pictures WHILE SMILING, so she has to stay. She was also on the photography ministry (usually this is my ministry at family functions) for the day, and she did an awesome job grabbing candids for me. Adrian shared great words, and blessed the house in only a way that a COGIC preacher can. A little back story for you, Adrian likes to tell people, that the first words out of my mouth to him were “Hey, Mr. Stuck-up.” I can neither confirm nor deny this revisionist history, but I will say, that it sounds like something that I could have said back in the nineties. 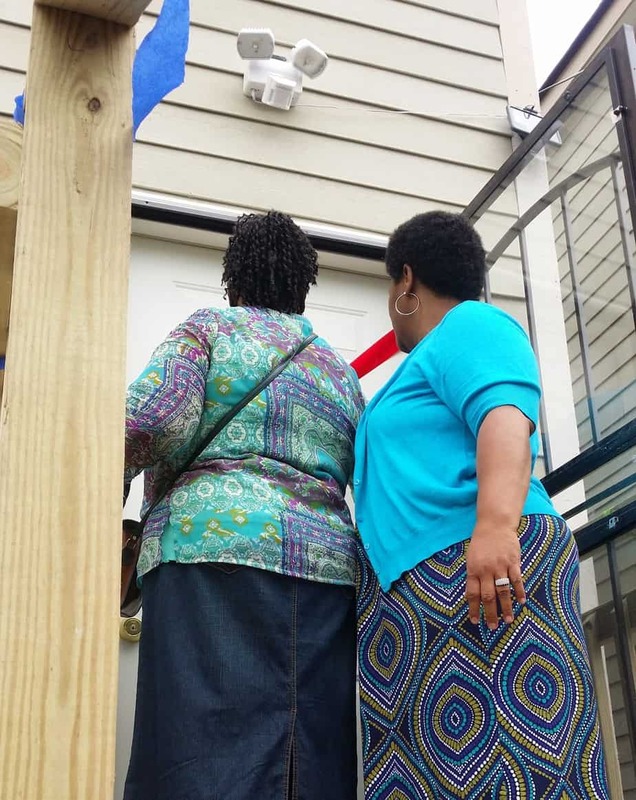 Our moms were then given scissors to cut the red ribbon on our back door, and then we were all able to go into and view the home! Of course, the ribbon cutting didn’t go down without a sense of humor. Our moms have known each other the entire time that Mr. Houseful and I have been acquainted. That’s 20 years right there. They also knew of each other BEFORE the Houseful got connected, so this is a LONG history of community right here. I tell ya, it was just meant to be. One of my newest neighbors (YAY) Antoinette, came on over. Most of you all know her as Sister Save-A-Lot, but I know her as a road trip buddy, and a great friend. She welcomed me to the neighborhood, and let me just be honest, I’m SO glad to know that someone like her is on my new side of town. Literally right up the street. My bestie came out and supported as well. In your head, I’m sure you’re wondering why this deserves a mention, but she just pushed a tiny human out of her body, and is tired like most mothers. I’m loving the fact that she pushed past exhaustion and came to see us. I love her! Our two home sponsors Renea and Marci came through as well. They were an integral part in us being selected as a partner family, and without their hard work in the beginning, we wouldn’t be here today. It was so good to see and hug them on the day of the dedication. I’m hoping that this is the start of a very good friendship! Other supporters included my aunt who drove all the way from Elgin, Il, my “sister” Kareeta (who you’ve seen in lots of Old Navy posts with me) my cousins LaTrice and Renee, my good friend, and manager of the best business mailing store ever – CJ, a friend that I’ve known from my first online forums Cariesha and her husband, and my aunt Jackie. Being able to go back through the photos makes me very happy, and lets me know that with this type of support, our home will always be blessed. I’m so happy for you! Been following along on Facebook. I can’t wait to see the completed pictures! That’s so awesome that you’ll be closer to Antoinette, too! Congrats sweetie! I’m late, but congrats on the home dedication! So happy for you and your family.